Journal of Frankenstein magazine #7 - The Legendary Journal Still Lives! MyMovieMonsters.com > Monster Magazine Marketplace > Journal Of Frankenstein > Journal of Frankenstein magazine #7 - The Legendary Journal Still Lives! 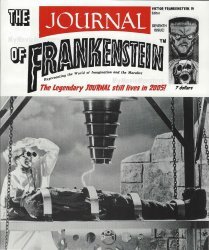 The Journal of Frankenstein #7, May 2005. Representing the world of imagination and the macabre. Issued in May 2005. 52 pages. Two-color cover and B&W pulp pages inside. All ads, contact information and website addresses directly related to Journal of Frankenstein, Castle of Frankenstein or Scary Monsters Magazine appearing in this magazine are no longer in effect. Please direct all inquiries to scarymonsters@mymoviemonsters.com.